Notice! Before making a purchase please read the Notes at the end of this page! “Build your outfit” tool allows shoppers to mix and match different items available in a store to get the desired look before making a purchase. This tool is a unique contribution to online stores selling apparel and accessories, and fits any other business where it is possible to create collages (sets). “Build your outfit” tool is based on AJAX and powered by HTML, Java Script, CSS, jQuery. By installing this module online store owners have a real chance to attract more visitors, turn one-time buyers to regular clients and encourage shoppers to buy more items at one visit. 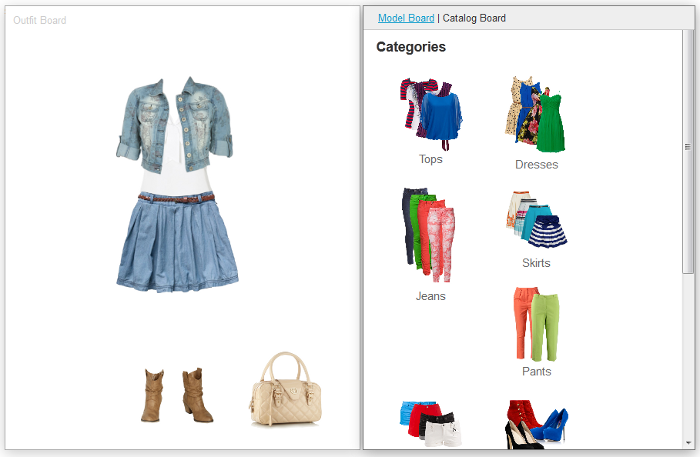 Easy to use interface with Outfit board, Model board (customer images) and Catalog board. Upload your own images (it can be a model image, clothes images, etc). All items available in a store are displayed on the Catalog board. Click on the item title to go to the product details page. Click on the item to add it to the Outfit board. Mix and match items to get the desired look. take photos of items available in a store, remove the background in any photo editor (transparent background is necessary). For the present moment a main product image is used by "Build your outfit" tool. Thus, it is necessary to upload an image with a transparent background as a main image for a product. The image is resized and displayed on the Catalog board. "Build your outfit" tool can be integrated in any existing shopping cart platform with open source php code by your request. Integration with Magento and CS-Cart is free. Integration with any other shopping cart platform requires additional charge.The integration cost will depend on the integration difficulty. This tool works correctly in Internet Explorer 7/8/9, Mozilla Firefox, Safari, Google Chrome and Opera latest browser versions. Life-time Software License on “Build your outfit” tool. Any customization by your request (for an extra charge). Complete integration with your shopping cart solution (Magento, CS-Cart, X-Cart, OpenCart, PrestaShop, Zen Cart, Joomla, etc). "Build your outfit" tool is a completely customizable solution. We understand that each project comes with its unique demands and challenges, that is why we offer a basic version of "Build your outfit" tool at an affordable price and ready to customize it to your business needs. Contact us to ask any questions. We are always glad to assist. 1. Purchasing "Build your outfit" tool, you get the module that includes the features and peculiarities described above and shown on demo (click Try demo tab). Other features that you may require will be added by your request as custom modifications that will be priced separately. 2. Purchasing "Build your outfit" tool, please let us know in the order comments what shopping cart platform it is necessary to integrate the module with. 3. Integration with unmodified Magento and CS-Cart is free. If your Magento or CS-Cart system has the modified files or third-party modules that can cause installation problems, the installation may require an additional charge. 4. For Magento Community: the tool will be available to you within 3 business days after the purchase is made. 5. For CS-Cart Pro, Ultimate, Multi-Vendor: the tool will be available to you within 3-4 business days after the purchase is made. 6. Integration with any other shopping cart platform (except Magento and CS-Cart) is discussed individually and will be performed for an additional charge. Please remember that we can make any changes in this add-on due to your demands, just contact us. "Hello g.p. and thank you for your comment! Actually the conception of this tool is to have the basic version of it and to customize it for a particular client. But we will definitely add more features to the basic version, it will take some time though. The features you recommend are all good and user-friendly. We can't promise to add all of them but we will consider all points and decide what is necessary first. Currently we have one planned feature in progress - Ability to add chosen items to the cart from the outfit board, it will allow shoppers to make purchases not leaving the Make you outfit tool. Keep up with our news to learn about further development of this tool. Also if you have any questions don't hesitate to contact us via our e-mail." i was happy to here from this project before xmas. now i am happy about this first version. + i would prefer to stay on the site if buy somthg. + if i make a bag to smole in size, i hide and lose the button for detail view for adding to the cart. + Some how there should be a fix convection border line for the model and also a fix position for adding a position about 10 positions. shoes, hat, bag and so on. configuration by categorie name or number of articel categorie. dynamic mapping and also other free position option like now. after this you choose convection color again and after this you put the article in a loop into the default shopping cart. + i would like to try also article groups, so i take a group and put inside the whole thinks at once or show them in one categorie. a little bit more functions from the h&m dressing room would it make easyer to sell this cool plugin to a customer. + in the demo you should try to use only perfect oriented and size pictures for the shoes. but over all this step make it open for der admin. in the article should also be different color and size for one porduct. but at first time i can also stand it without this. + is there some configuration in plan... i would like to see the backend. and i would use the articel img1 if you put it to the board and the shop img 2 for normal shop view. like this you could make perfect look and feel. the admin has to make 2 images. it could be a extra option "use img0 for dressingroom and img1 for catalog"
+there should be also a cookie or some other store to remember my actual model and articles on the shop site board. a little more functions an you can rise the price to 400 $.